You can cut the drumsticks off and make two pieces from one leg. Also you can use it as a whole leg. Place the chicken legs or meat cubes and oil in a large skillet and stir occasionally for 2-3 minutes, until the meat changes in color. Add the chopped onions and sauté. Then stir in washed rice and continue stirring for 2-3 minutes. Add salt, black pepper and paprika. Finally place this mixture to a casserole or Pyrex dish and add hot water. Stir the mixture well and place the bay leaves evenly in the mixture. Preheat the oven to 400 F (200 C) Cook for about 30-40 min. 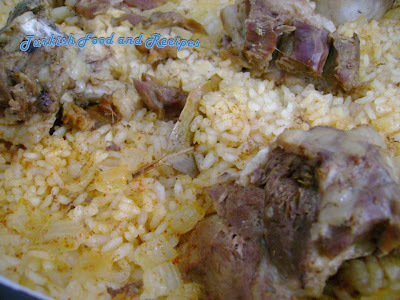 until the surface turns brownish and rice is cooked. Butlari eklem yerinden kesip iki parcaya ayirabilirsiniz ya da butun olarak da pisirebilirsiniz. Tavuklari ya da et kullaniyorsaniz etleri yag ile birlikte bir tavaya alin ve orta ateste 2-3 dakika boyunca karistirin. Etler renk degistirince soganlari ilave edin ve 2-3 dakika daha karistirmaya devam edin. Sonra yikanmis pirinci ilave edin ve 2-3 dakika karistirin. Tuz, kirmizi biber ve karabiber ekleyin. Son olarak bu karisimi borcam ya da normal bir tepsiye aktaralim ve uzerine sicak suyu ilave edelim. Defne yapraklarini ister parcalayip. Ister butun olarak tepsiye esit araliklarla yerlestirin. Onceden isitilmis 200 C (400 F) firinda yaklasik 30-40 dakika pisirin. This was a nice, subtly-flavored dish which we enjoyed for our Sunday dinner. We did add a dash of lemon juice, but otherwise it was lovely. I loved this easy and simple dish, I added potatoes (cut into small cubes) as I didn't have enough meat. I put them in just before the rice and after 30mins in the oven I added more water and left it in the oven for an extra 20mins, also I didn't have any paprika and substituted this with cumin! served nicely with yogurt. I will be keeping this one on the weekly dinner dishes :) thank you so much! !